The Town of Oliver has received full funding for an exciting community arts project called the Canada 150 Mosaic Mural. Six hundred tiles will be individually hand-painted and mounted to create one iconic image representing Oliver. Each tile, while restricted to certain colours, can be painted in a mini-scene of each artist’s own choosing. The finished artwork will be assembled and permanently installed on the east side of the Archives building, facing Main Street near the John Oliver statue. Every person in Oliver BC, artist or not, is invited to paint their own tile. It only takes one hour! Children, seniors, all abilities are welcome. This is a terrific opportunity for groups, organizations, and classes to paint together. Gather your art group, book club, friends, neighbourhood, church group, school class — whatever! — and make a fun group activity. Or book yourself solo and celebrate the “150” with other folks in your one-hour time slot. The painting days are Tuesday May 30, Wednesday May 31 and Thursday June 1. Times are 10 – 7 on the first day, and 10 – 4 on the last two days. Closed for lunch from 12 – 1 each day. Pick the best one-hour slot that works for you. The arts council is providing the painting venue, the Quail’s Nest Arts Centre, 5840 Airport Street. There will be room for between 30 and 40 participants per 1-hour slot. You can book for yourself, or on behalf of your group, but you will need to provide the exact number of participants at time of booking. Don’t miss out! Create a lasting memory and celebrate Canada’s birthday with us! Janet is passionate in her work with fabric. She finds the textures that emerge from manipulating fabrics delightful. She hand dyes and paints the fabrics in her art. She loves mixing media, fabric and paper in particular. She always uses stitch to join and elevate the mix of media. Her goal with fabric creations is to excite viewers to appreciate the beauty and mystery of living thing. There is so much around us that is magnificent if only we would take the time to notice it. Please join Janet at the “vernissage” Artist Opening Event on Saturday, March 4, from 11am-1pm. by Michael Jorden, B.Sc., M.B.A. In March 2010, I received a phone call from Steve Staresina, an Oliver painter who I had known as one of the Oliver artists associated with the Quails Nest Arts Center. Steve had a vision that, because of the closure of an established commercial gallery on Oliver’s Main Street, an opportunity had arisen to create a new commercial gallery dedicated exclusively to local artists from the south Okanagan. He was determined to make sure Oliver continued to have a community art gallery. The Oliver Art Gallery – well into its third year – exists because of his vision. No dreams however – no matter how noble – are brought about without effort. A few hundred hours of ‘sweat equity’ were invested in bringing about this vision – by Steve in particular and his intrepid assistants including yours truly. In April 2010 the Oliver Art Gallery opened its doors with six members. Today it is a registered artists Co-operative with twenty one members and running like a well oiled machine. This month, Steve is the featured artist at the Oliver Art Gallery. His choice of medium is oil and acrylic and his subject matter is the landscapes and people of western Canada. As a child living in Croatia, Steve was influenced by Roko Stokic, a wheelchair bound artist with whom he spent countless hours sketching hands, feet, faces and figures of friends and neighbours. He stood out among his peers and had his first art gallery show at the age of seven. He has had a varied career in business and the construction industry but has devoted himself to painting full time only since retirement. He is a participating member of a number of arts organizations including the Oliver Community Arts Council, Oliver Sagebrushers and the Oliver Art Gallery Artists Co-operative. Steve’s work will dominate the gallery during September. Come and view his art Tuesday through Saturdays between 11:00AM and 4:00PM at 6046 Main Street in Oliver. The Oliver Art Gallery is also presenting Art Classes for the fall. Come in and register for drawing classes, painting classes, pastels and more. [slideshow_deploy id=’7677′]June is the month where the South Okanagan starts to hum. With daily sunshine, sweet smells from the orchards, people are happily looking foreword to Summer. 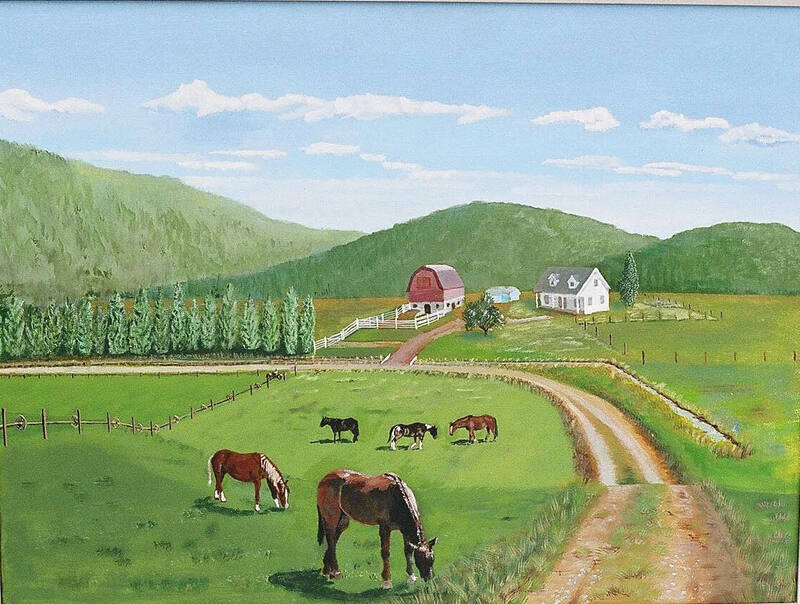 The Oliver Art Gallery Artists, are also inspired to go out and paint the local scenes and produce more of the fine art, the gallery is famous for. This month, as a special to bring in Summer, we have a double spectacular show by featuring, not one, but two of our fine artists. The art of Nancy Gray and Jennifer Farnell will be displayed during June. These two are spectacular artists in different ways. One is a detailed realist, while the other is inspired by life’s situations and emotions. Nancy Gray took several art classes in 2003, which re-ignited her need to be creative. She continued painting and then moved to the South Okanagan in 2007 and thoroughly loves it here. After getting established, she joined the Artists on Main in Osoyoos in 2008 and then the Federation of Canadian Artists as a supporting member. She was juried to Active status in May 2009. In June 2012 she joined us, at the Oliver Art Gallery. Nancy usually works in watercolour, however she does like to explore in other mediums like graphite and acrylic. Jennifer Farnell paints from life’s inspirations, feelings and imagination. She never uses a reference photo. Her work lets the observer interpret whatever it is they may see or feel in their own unique way. Jennifer paints mainly in acrylics and he work has sold in many venues between Alberta and B.C. The Oliver Art Gallery is lucky to have Nancy and Jennifer add to the variety of styles and mediums by its 20 artists. Drop in to view the high quality art, ceramics and jewelry. The gallery is at 6046 Main Street, open Tuesday – Saturday from 11:00 am to 4:00 pm. The Oliver Sagebrushers are promoting Children’s Art classes. The next semester will begin Saturday April 21 and running for 6 weeks. Please contact Leza at or Sally at The spring weather will allow us to get started on more murals. The Quail’s Roost Art Gallery at Rustico Farm and Cellars Winery will be open to the public for Easter. We will be celebrating our first anniversary in May. New members to the Oliver Sagebrushers are always welcome. Adults, feel free to drop in on Tuesday 9 a.m. to noon at the Quail’s Nest Arts Centre on Airport Street (95th St.) or children with ;parents on Saturdays 9 a.m. The Oliver Sagebrushers are ready to start the second semester of Children’s Art classes. Classes run every Saturday from March 3 – March 31. March 31 will conclude with a Reception and Art Show. The classes will be instructed by Leza Macdonald accompanied by a member of the Sagebrushers. Leza is a skilled, energetic and fun art teacher. Kids will enjoy discovering their talents under her tutelage. Parents and guardians are welcome to stay and learn along with their child. Classes are kept to between 10 and 12 participants. Please register early by emailing Leza at leza @ eastlink.ca. Find your Valentine something special all month long. No RSVP’s required. Stop in, say hi… see what’s new… have a sip of red or white in honour of St Valentine! Paintings, prints, cards, gift certificates, and more! This will include some supplies. Please register to avoid disappointment because the classes will be kept to 10 per class. The Oliver Sagebrushers Art Club are celebrating the opening of a second gallery room at Rustico Farm & Cellars Winery, where they have been showing their works over the last several months. The artists’ productivity and sales have warranted this new expansion. Join them to celebrate a Cowboy Christmas! Tour the new gallery area, stock up on gifts of art and wine, listen to some live country music, and chow down on some warm chili and hot mulled cider around the campfire. Artists will be on hand throughout the weekend to tour or answer questions. The entertainment will feature country singer Mikie Spillett from 3-5 p.m. on Saturday Dec.3. Everyone is welcome: It’s family fun! The monies donated during the Cowboy Christmas will go to the Desert Valley Hospice Society.